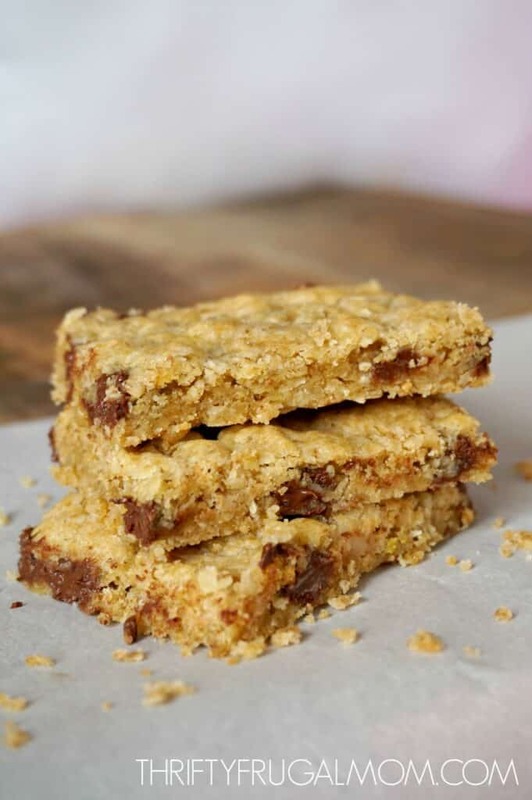 These family-favorite Oatmeal Chocolate Chip Bars, also known as Davy Crockett Bars, can be ready to eat in just 20 minutes. They’re a perfect combination of sweet and just a tiny bit of salty. Absolutely irresistible! It’s a rare person that doesn’t love an oatmeal chocolate chip cookie! Am I right? Well, good news! 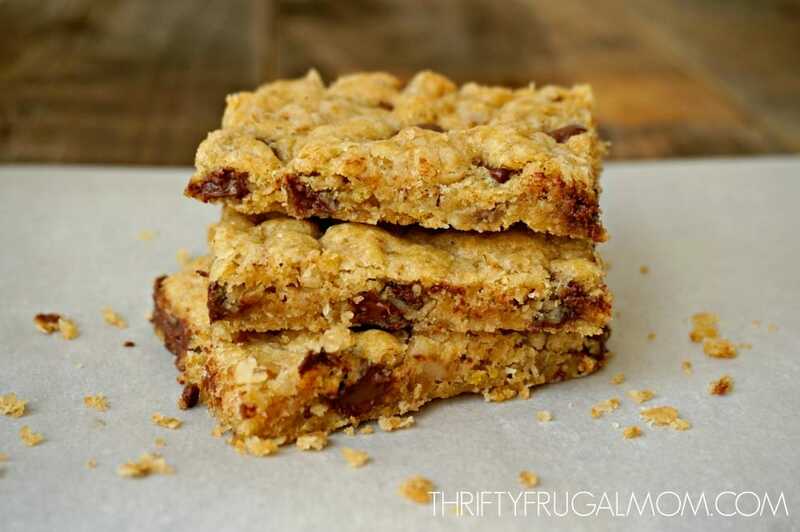 These Oatmeal Chocolate Chip Bars are like your favorite oatmeal chocolate chip cookie but in bar form. In other words, way less time consuming to make but every bit as delicious! And who’s going to complain about a tasty dessert that takes all of 20 minutes to mix up and bake? You really can’t beat that! I still remember the first time I ate one of these Oatmeal Chocolate Chip Cookie Bars at my in-law’s place. They looked good but didn’t appear to be anything extraordinary, so I didn’t expect to be wowed. But with my first bite I immediately decided that even if they didn’t look amazing, they totally tasted amazing! Slightly chewy and the perfect combination of sweet with a tiny bit of salty, these bars are hard to resist. And it totally makes sense to me why my mother-in-law makes these bars as frequently as she does. As a mom of 10, she definitely has learned the value of saving time by sticking with simple, easy recipes! 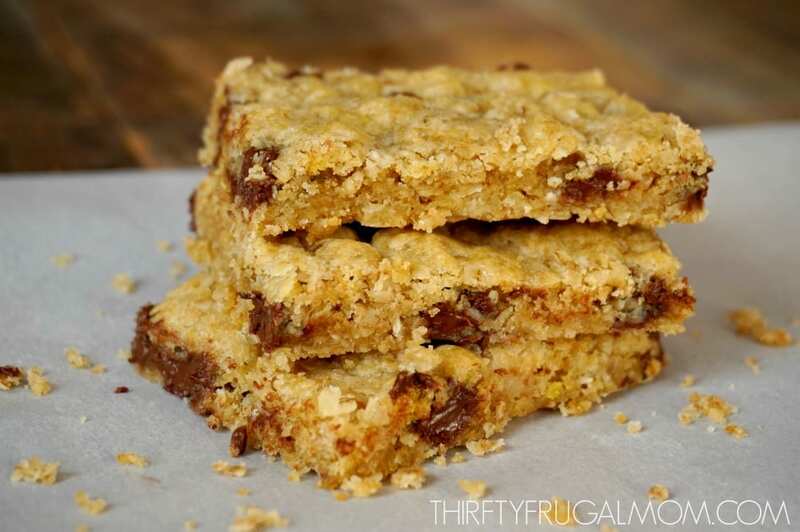 And when you find a recipe for oatmeal chocolate chip bars that is as good as this, uses basic pantry staples and takes just 5 minutes to mix together, you know you’ve found a recipe that’s worth making often! I also really love how cost effective this recipe is. As the price of butter continues to rise, I often think of the words of my witty friend who said that she’s always happy when she finds a good recipe that doesn’t call for butter because she “Can’t Believe the Price of Butter” right now. And I totally know what she means! At $3/lb. or more, it kind of hurts the budget a bit if you use it a lot, you know? While I’m not willing to settle for switching to margarine, I don’t feel bad for occasionally using canola oil as this recipe does. Definitely helps keep my grocery budget down! One more thing. You probably noticed that I call these bars Oatmeal Chocolate Chip Bars in the recipe title and then say aka Davy Crockett Bars. I honestly have no idea why they are called Davy Crockett Bars, but that’s what my mom-in-law calls them and it’s what we typically call them. But I wanted a recipe name that, when someone happened across the recipe on my site or on Pinterest, was a bit more clear exactly what the recipe was actually for. Because while Davy Crockett Bars is definitely a memorable name, it’s certainly lacking when it comes to making it clear what the recipe is for! Combine flour, sugar, salt, baking powder and baking soda. Mix in brown sugar, oatmeal and chocolate chips. Add egg, oil and vanilla. Mix thoroughly. You can easily double this recipe to make a jelly roll pan of brownies if you need a big batch! I can't wait to try these! We usually have these ingredients on hand. Thanks for sharing! Yes! I love that these bars use simple ingredients that I always have on hand. I hope you all enjoy them as much as we do! I made these today and they are just delicious! Thank you for putting your time and effort into making these and sharing. This recipe will be added to my family recipe box. Added to the family recipe box? That's a high compliment! :) So glad that you all enjoyed them. And thanks for taking the time to let me know! I made them yesterday, and they are fantastic. Many thanks! Quick, easy, low cost, and delicious. Who can ask for anything more? I will be making them often. Pantry staple recipes are my favorite too, Kallee! And I totally agree about the real vanilla prices. I'm grateful for Aldi but even there, it's more than I used to have to pay. Not only does your recipe sound delicious, but I love the details of Davy Crockett Bars, down to the use of canola oil. Thanks for sharing. I love the name Davy Crockett bars! I have never heard of that naming variation. These look delicious, especially for a potluck. Yeah, I really wonder why they were named after him! :) And these always disappear at potlucks- one of my favorite desserts for that type of thing. Love cookie bars and these look amazing! My kids would love them too. Will definitely be giving them a try! Hope you enjoy them, Kim! Would whole or old fashioned oats work? I don’t keep quick oats. Amy, I've only used regular oats when I've made these, but a reader left a comment on my Facebook page recently saying that she made them with old fashioned oats and they turned out great. So I think you should be fine!